In honor of our trip to Paris one year ago, I decided to share with you a few of our favorite picture books that take place in Paris! We already love and own two classic picture books about Paris — Madeline and Mirette on the High Wire. These will always be my first loves, and they rise above any others as enduring classics. Do you know and love them as well? These new favorites pictured above, though, all come from this extensive list that my friend Becca shared with me a few months ago. I found most of them at my local library. 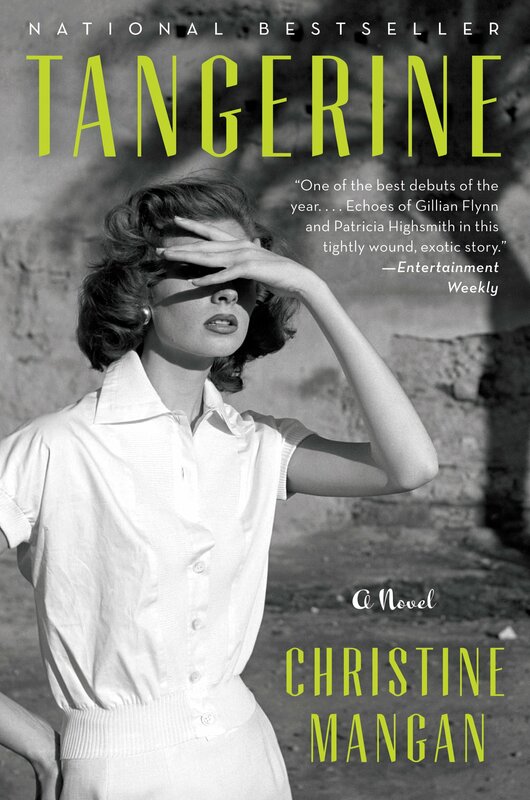 Some weren’t that great, in my opinion, like this one — I just can’t love this character, try as I might, and the book was a headache to read aloud. But these six are our new favorites. They, along with Madeline and Mirette, are the crème de la crème, as they say! A cheerful book without many words, this is great for teaching children how to say hello in French. 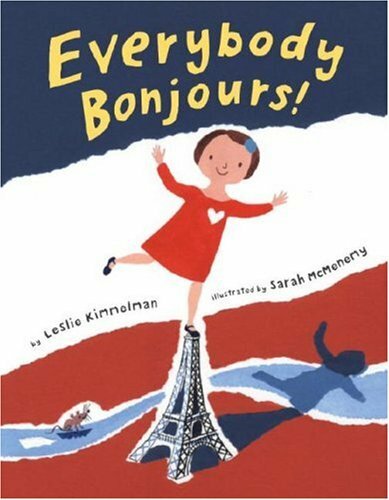 A young girl travels throughout Paris — to a patisserie, a soccer game, the Eiffel Tower — and everyone says “bonjour!” wherever she goes. Helpful for teaching children — and adults! — that greeting with a bonjour is essential before any interaction in France. I wish I’d read this before we visited. This is a sweet and simple book, and not super Parisian, but Lena really enjoyed it, so I’m putting it on the list. 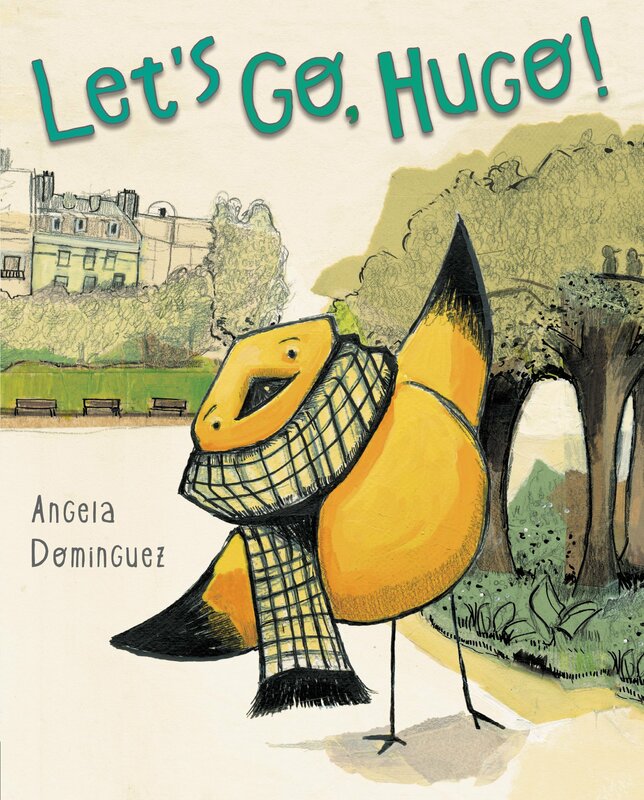 Hugo is a dapper bird who loves his city, but he only loves it from the ground — because he refuses to fly. Then he meets a lovely little bird named Lulu who convinces him to spread his wings. How long can he keep her on the ground? Will he ever learn to fly? 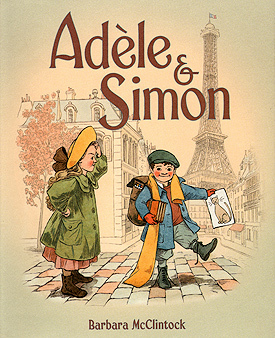 Adele and Simon are a brother and sister walking home from school in Paris who see their friends and the sights of Paris along the way. Simon, however, has his hands full of books and crayons and binoculars, and he can’t seem to keep track of them. He loses something on every page! Can you find them for him? The illustrations are beautiful, and both Lena and I loved this book. I also recommend Adele & Simon in America. What a wonderful book! If you are planning a trip to Paris, this is essential reading — and it would make a charming gift for an adult, too. The author writes the book to you, the reader, with wonderful pictures of everything you will see and do in Paris. The illustrations are gorgeous, the writing is tongue-in-cheek, and the whole book is fresh and delightful, even though it was written in the 1960s. Check out the rest of Sasek’s travel series as well. Now, even as I put together this post I came across more picture books set in Paris that I haven’t even heard of yet. We even have one in our house right now — The Tooth Mouse — that takes place in Notre Dame and is just wonderful. 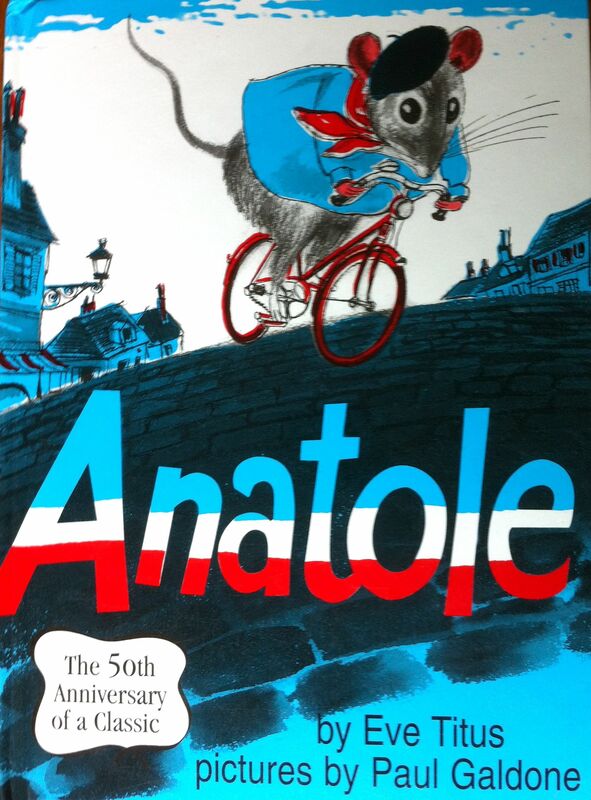 Do you have any favorite picture books that are set in Paris? We’d love to hear! How Do You Get Rid of Things? Happy 4th Birthday, Lovely Lena!!! Lovely books – I have This is Venice and I love the illustrations. 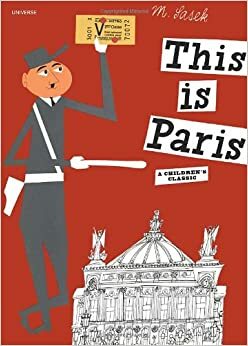 Have you read Mr Leon’s Paris by Barroux – it is beautifully illustrated….I saw it at an exhibition on children’s illustration at the National Gallery of Scotland a couple of years ago – or Eloise in Paris? I have heard of “Mr Leon’s Paris” but unfortunately neither of my local library branches has it. Such a bummer! I might have to order it instead. It does look lovely! Bonjour mon amie! Did you write this post for me??? I love it! I haven’t heard of any of these books, except Anatole, which we have at home and Lucie and I were reading last night, actually. We made it almost all the way through and then she just shut it all of the sudden and said “This one’s all done, mom!” I think she’s still better with slightly simpler books. One question- do you know how to pronounce “Simon” in French? It’s like this- “See-moh” with the nasally “N” at the end. :) Can’t wait to check some of these out, hopefully from our library here in Fburg! I didn’t know it was such a tradition! I like it better than the tooth fairy. Loooooove this post! You know me, determined to raise little Francoohiles! ;-) I actually hadn’t heard of most these (though we have Mirette, and I think every Madeline ever written), so I’m going to check them out for sure!! Thanks! Yay, so glad it’s what you need! We’ll be on the hunt for more and might do another post about it sometime… who knows?! Thank you for the list! I have lil grandkids and are hoping for some petit enfants in Paris after our daughter’s wedding this spring. Sounds delightful! These would make some fun reading for them, for sure. I remember that Jenna loved the Madeline books. As a matter of fact, those are some of the few children’s books that I’ve kept! Yes, they are definitely favorites around here! We have four Madeline books, I think, and would definitely enjoy more! Here are a few more in this genre for you to check out that my kids and I really like!